Water, High Fructose Corn Syrup, Apple And Grape Juice Concentrates, Citric Acid, Water Extracted Orange And Pineapple Juice Concentrates, Ascorbic Acid, Natural Flavor, Vitamin E Acetate. Twist Off Top, Caution Do Not Squeeze While Opening. 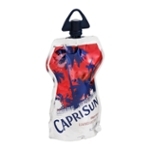 Do Not Drink If Pouch Is Leaking, Damaged, Or Swollen As Fermentation Can Occur. If Tamper Resistant Seal Is Broken, Do Not Consume.